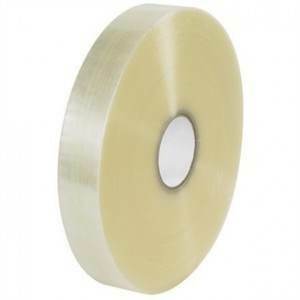 Our machine acrylic carton sealing tape comes in at least 1000 yrd rolls and is made specifically for carton sealing machines. This is a great general purpose packaging tape that performs well in a wide temperature range and works as a good closure for light weight boxes exposed to minimal distribution hazards. 159610 2" 1000 yds Clear 1.8 Mil 6 3 lbs. 12397 2" 1000 yds Clear 2.4 Mil 6 3 lbs. 159611 3" 1000 yds Clear 1.8 Mil 4 3 lbs. 12998 3" 1000 yds Clear 2 Mil 4 3 lbs. 325914 3" 1000 yds Clear 2.1 Mil 4 28 lbs.